Needles and Hooks and Books, Oh My! 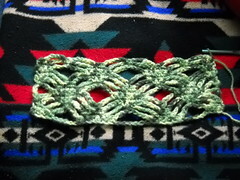 : WIP Wednesday: Knit and Crochet. 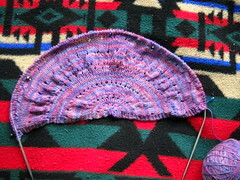 I'm participating in Tami's Amis Work-In-Progress Wednesday-- see more cool stuff here. 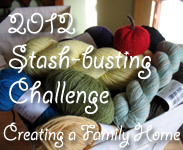 I'm also linking up with Tricia's Stash Bash. 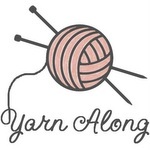 This week I am mixing things up, and have both a knitting project and a crocheting project to share. 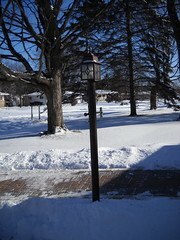 That's all I've got for today-- I'll leave you with a pleasant image- we FINALLY have snow! Your citron is looking lovely. I have it in my queue but I'm wary of those incredibly long rows at the end! Love how the crochet is looking so far! I love the wrap - very cool! Your crochet is lovely - way trickier than anything I've tried.